In "The Awakening Ground", David Chaim Smith guides the reader through the different stages of mystical contemplation, suggesting that the purification of perception is an alchemical distillation. In the last few years David Chaim Smith has been quietly amassing one of the most profound bodies of work in contemporary Western esotericism. The Awakening Ground: A Guide to Contemplative Mysticism is his most recent published work (there are a couple more already lined up), and his most refined yet in expounding a path of non-dual contemplative mysticism. 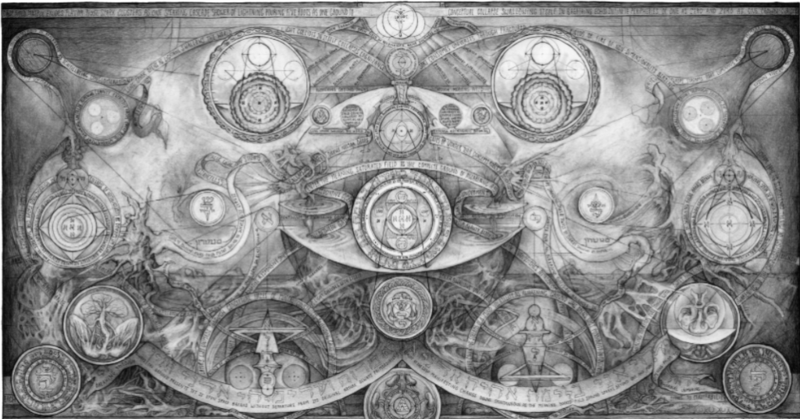 His work is distilled mainly in Kabbalistic imagery —both in written word and in enigmatic geometrical artefacts that evoke dark alchemical diagrams— but it also draws heavily from different mystical traditions, including an “unbroken lineage of gnostic realization”. What might be radical in his approach to Kabbalah is a non-theistic, non-emanational view in which the Monad (the Godhead) is the last reification in the contemplative path, seen as an “all”, the ultimate object, it is the last obstacle in the realization of the whole of manifestation as pure, luminous, non-dual awareness. Chaim Smith posits that En Sof (the Absolute, the Infinite) is equal to the ground of phenomena, to space itself and its endless display of creative energy, En Sof’s “trascendental essentiality is expressed as immanent manifestation”. As such, all the manifest universe is always the pure, open and undiminished light of En Sof, but we have become deluded by our reifying habits and perceive it as a universe of things —separate, concrete, opaque and contained. “En Sof never steps down from its purity, however, its light can be approached from both the side of the containment and the uncontainable”. The system set out in The Awakening Ground is quite sophisticated but certainly not one that is lacking integrity and beauty. It is in itself a complete path to self-liberation through a training of the mind that seeks to set free the congealment of the subject-object construct by directing awareness to the exact spot where duality arises and openness is contained. What we perceive as a substantial and impermeable world might just be the result of our grasping at appearances as objects; the repetition of this perceptual habit creating a divide between the subject and its objects, giving each one a sense of solidity which can be likened to a shell or klipah, which, in some Kabbalistic interpretations, restrain us from the holy primordial light. The good news is that this process can be unmade, without the need to add anything to our own basic nature. Uncontrived contemplation in itself can cut the root of the basic reification of a knower and a known, by allowing the mind to recognize that what is being displayed as external phenomena are actually the “sparks” of its own awareness. “The practice of sacred contemplation is based on the understanding that the mind’s essential nature is shared equally with whatever it observes, and within that confluence the ground of all things can be directly recognized”. The book invites us to partake in the marriage of awareness and manifestation, of space and light. Love of silence is a kind of hunger or thirst. It goes profoundly deep. The urgency to bind with it is like fire that intensifies gnostic aspiration. Chaim Smith echoes great lyrical mystic masters of the Western tradition who have waxed poetically on the virtues of silence and stillness.This silence filled with a kind of ardour is at the threshold of St John of the Cross’s Dark Night of the Soul, which is set out only “in darkness and concealment,/my house being now all stilled”. As silence dissolves constructs in its still waters, the mind can first glimpse the virginal purity of space, ever-pregnant with light, the pristine beauty of the world… this is enough to ignite the long solitary path of the mystic back to its beloved, the “flight of the alone to the alone” (Plotinus). “Love for the silence and the beauty of basic space is the mark of the aspiration that sets meaning free”, writes DCS in The Awakening Ground. To begin with there are moments, subsequently minutes, then “quarters of an hour” for which complete silence or “concentration without effort” lasts. With time, the silence or concentration without effort becomes a fundamental element always present in the life of the soul. It is like the perpetual service at the church of Sacré-Coeur de Montmartre which takes place, whilst in Paris one works, one trades, one amuses oneself, one sleeps, one dies… It is in like manner that a “perpetual service” of silence is established in the soul, which continues all the same when one is active, when one works, when one converses. This zone of silence being once established, you can draw from it both for rest and for work. This perpetual service of silence can be called upon in the midst of “whatever appears”. As DCS says: “Direct interface with mystery is always possible, as the silence of basic space calls trough its myriad appearances”. The root aspiration that lights-up in silence is “to abide beyond the wall placed between inner thoughts and feelings and outer perceptions”. In silence dawns the undifferentiated state, the fallacy of inner and outer, the inseparability of mind and sky. Silence is part of the “mixing field”, the first gate in The Awakening Ground’s system of six gates (all presented in alchemical symbolism) through which the contemplative can achieve the state of the tzadik, the realized sage of Jewish mysticism. This tzadik, Chaim Smith says, is beyond identity and grasping, he “has no individual psyche in the sense there is no more attachment to the meaning of relative phenomena”. He abides in the recognition of the absolute, for him each spark of the light of En Sof (Aur En Sof, the creative self-glow), is “complete wholeness”, instantly liberated. “The tzadik is nothing other than this spark of silence assuming form, which nullifies the separation between its singularity and infinite variation.” Like a hero in the cosmic drama of the Tzimtzum (the contraction of the light to vacate space for the manifest world), the tzadik has raised the sparks and released the shells, simply by recognizing that the “the boundaries implied by the Tzimtzum process, like the hierarchy of worlds and sefirot, only pertains to relative distinction. The absolute is always only En Sof”. The whole of the manifest world and each of its layers never actually leaves the ground of essentiality, “except within the klipot of perception”, light is a simple unity which “radiates wholeness itself”, as Jewish teachings hold “the divine is perfectly whole and cannot be interrupted”. Because appearances are primordially pure beyond the stains of conceptuality and fixation, one can achieve the “alchemical distillation of gnosis” through the recognition of “a single spark of the ground within the perceptual field… Like a lightning flash, knowing and the known collapse together in a single instant, and infinite sparks follow the wake of the opening. Each consumes the whole world, yet the world never disappears”. The Awakening Ground is a love of silence, but it can also be thought of as a contemplative’s love-song to space and light, or to a “spark field” that unfolds the paradox of a “changeless ground that always manifests as constant change”. It is the greatest wonder that this “changeless ground”, which is always absolute essentiality, is “thrust into continual variation beyond origin, destination or substance”. Being a “luminous nothingness”, it still manifests as everything, “substance appears, but not as fact —rather only as “opinion”’. From the contemplative’s perspective, the world is seen as the play of awareness and appearances, as a living symbol that carries the meaning of the absolute “inherent in its relative display”, as a “dream body” arising from the cohesive dynamism of the sparks or, in theistic terms, as “the living flesh of a god” (a god that is also a beast, a magnificent kosher pig, that must be sacrificed in the altar of space). The sparks are alway coming, as the nature of the ground is an uncontainable creativity, this in Kabbalistic terms is the B’reshit aspect, the “dynamic essence of wholeness” that is always releasing the sparks from an ever-spreading fountain. B’reshit is the first word in the Book of Genesis, which David Chaim Smith says should be translated as “in-beginningness” to show that the divine creativity is always —at this very moment— giving birth to the world (space is like a divine womb pregnant with light). But what is more striking is that this continual thrust of creativity is also at the same exact space and at the same exact instant always collapsing. Mystics of all traditions and even modern scientists have noticed that time is an illusion (“albeit a persistent one”). DCS likes to quote the Sefer Yetzirah: “The end is imbedded in their beginning, and their beginning in their end, like a flame in burning coal.” Each instant, complete in itself, can be thought of as both the Genesis and the Apocalypse, the Manvantara and the Pralaya, the Tzimztum and the Tikkun Olam. Arising-in-dissolving, like the ebb and flow of tides, like the inbreath and outbreath imbedded in all life. Contemplating the parade of non-dual manifestation and dissolution brings about an aesthetic quality to life and an intimate sense of the sacred. It is by realizing this that all of our gestures become meaningful, the “scintillating dissolution” of the ground resonates as felt-tones. “Dissolving-in-appearing is the quintessential gnosemic gesture: a continual self-consumption that arises as all things without ever contradicting itself. It is known as the simultaneity of solve et coagula”. The unwavering awareness of this process, which links through hermetical analogy man and the cosmos (“sky and earth collapse into a single sacrificial gesture”), allows existence to embody its deepest meaning, that of an endless sacrifice. The body is a whole offering, which sacrifices itself through the alchemical process.Immersion, absorption, and surrender unify the beast, and send its twitching impulses off garmented in clouds of variation, perfumed with the smoke of aspiration. Its smoldering flesh passes away in each moment. All constructs are impermanent, and their passing away is used by the practitioner as a sacrifice. The dissolution of phenomena is inherent in every moment anyway so why not infuse it with gnostic intention? Why not make what is already happening into prayer? Sacrifice turns into a bath, a purification that is also a gnostic intoxication. David Chaim Smith suggests that the process of contemplation –the events of perception, the recognition of the ground– release an alchemical distillation, what he called in an earlier book “the intoxicating nectar of vision”. In a sense what happens to the contemplative mimics the creative display of the universe: as the light of En Sof pours in and passes through the sefirot, it can be said to release drops of shefa (“wisdom effulgence” “substanceless luminosity”). These are the same sparks of gnostic realization which, metaphorically, in the ecstasy of the contemplative, form a kind of “substance” of wisdom. This should not be taken literally, but the image Chaim Smith draws is quite compelling. One can picture the universe anthropomorphically, as the Ancient of the Days, as a great ethereal being (also referred to as Atika Kadisha) made up of the ten sefira that chart the process of manifestation, both as a divine anatomy and as divine algorithm. At the cusp of the sefirot “The shefa streams a crystalline dew, which pours from the gap between the skull of Atika Kadisha (keter) and what the Zohar calls the “above-above” (En Sof)”. This process that unfolds continually at a cosmic scale resonantes with the inner alchemical and yogic psychochemical transformation that is produced in the body of the practitioner when he or she crosses a gate of mystic realization. The ethereal substance referred to as a “crystalline dew” gives name to a previous book, The Blazing Dew of Stars, where DCS writes “brilliance pours the dews of stars through the darkening layers”. It evokes the alchemist’s morning dew, the Spiritus Mundi, a matter that has been impregnated by spirit, used in the production of the universal medicine. It is also the “secret mercury”, the universal solvent that dissolves all boundaries. It has a kind of holographic nature, through which En Sof can be recognized. It is a drop, it is a single flash of the mind, but it is wholeness itself. This is the dream that dreams itself wake, restless in the upheaval of its qualities. Mists of crystallines dew collect in swirls and streams of unfabricated primordiality. Each cluster is a drop, and each drop spreads a universe; a crown in the head and a kingdom to walk upon, raining, mixing, binding, dissolving, and churning in endless permutation. The lightning flash of appearance is its offering. “Nature uses only the longest threads to weave her patterns, so each small piece of her fabric reveals the organization of the entire tapestry”, wrote physicist Richard Feynman. The esoteric cartography of The Awakening Ground coincides with this view of fractal cosmology: “Each projection is a thread that cannot be separated from the ground that presents it”, and also: “Each aspect moves every other aspect of an infinite array. The field of connections is literally space itself. It is so full it is open: infinitely vast –a living tapestry of openness appearing”. Each drop is a gate, DCS, tells us, and each drop is also a vowel, alef (“the wholeness that flows in”), the point where all other points exist simultaneously, the ubiquitous center of the universe. The vowel letters are the writings in the wall of space, carving out worlds in their sparkling play (in his translation of the Sefer Yetzirah, Aryeh Kaplan points out that the number of stars in the universe is the same as the permutations of the letters of the Hebrew alphabet). The crystalline dew that falls from the skull, dripping uncontainability through the shells, is the bliss of the contemplative recognizing the energetic display of phenomena as its own awareness, basking in the magical fireworks of “ a-thousand suns in colours beyond the ultraviolet spectrum”. It has been described as nectar, ambrosia, amrita, mana, elixir, a mysterious analog of enlightenment. It is perhaps the eternal delight of energy (as Blake wrote) self-liberating and nullifying the difference between Keter and Malkut, and rendering the body of the tzadik as a kind of gnostic garden -“the unceasing energy of the visionary paradise known as Eden”. “The work ‘below’ brings rain from “above”’, writes Chaim Smith in his earlier The Kabbalistic Mirror of Genesis. This rain is shefa “a blessing force”. Perception is cleansed and everything can be seen as it is: “The central message of the Edenic allegory is that when perception does not obscure Divinity, everything is bliss. In fact, the word Eden itself means ‘delight’… When they are not obscured through the self-serving concern and illusions, all phenomena are the Garden of Eden”. David Chaim Smith is flying in the Merkavah —gnosis’s own delivery system—, the celestial curtain having been unbolted by Metatron, and taking us with him in a ride to the heart-drop essence of mystical contemplation, weaving together the pith braids of various unbroken traditions. He does it not only with a philosopher’s mind but with an artist’s eye and with a mystic’s heart. The philosopher might aspire to understand “the mind of God”, but the poet feels the richness of the light and resonates with the bliss of its ceaseless creativity, and the mystic praises its display as it bejewels space with a blazing dew of stars. Play and prayer and practice become one. In each spark are all things, DCS seems to say, and by the recognition of the true nature of only one spark, one drop, one thought, all this great insubstantial edifice of fear and hope is unmade. Still a “perfect scintillating radiance remains… standing-in-dissolving in its variation” endlessly breaking through all constructs, open free luminous “without specific goal or destination, it is the living seal of no (En) end (Sof)”. When the self-glow of En Sof surges, there is always the possibility of reification or of recognition (wisdom); when reification occurs subject and objet are born, and what is pure awareness clothes itself in a body, a world, a realm… with all its clusters, habits and shells. Because there is no limit to how the creative thrusts of the Infinite (En Sof) can be presented, mind can confuse itself and doubt its true nature. But even though this concrete worlds emerges, all is only open light-awareness, the universe is the ornament of wisdom. As DCS likes to say “matter is only an opinion, substance a rumor”. The Awakening Ground traces a path of “dedicated spiritual practice”, beyond mere philosophy. Arguing with words and diagrams that are not only enticing but even intoxicating that “we get the universe we deserve”, the world we experience is a display of our cognitive state. There is no way around the purification of perception and the training of the mind in spiritual path. The serious student of esotericism and mystical philosophy will do well if he keeps an eye for David Chaim Smith’s future work. There doesn’t seem to be many others like him out there that are actually taking the path and delivering the goods through beautiful writing and art. 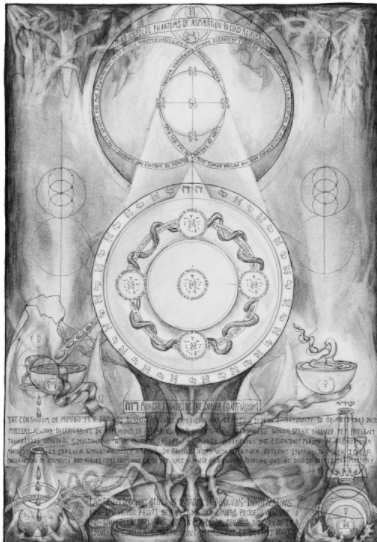 A review of David Chaim Smith's latest exposition of alchemical contemplation using rich Kabbalistic symbols and diagrams. ¿Qué son esas aguas donde ocurre la Creación? Las aguas que son divididas en el Génesis, las aguas sobre las que Brahma, con su ardor (su tapas), teje este mundo, encadenado por el deseo. "La totalidad de la tierra como la totalidad del cielo aparecen en el nacimiento así como en la muerte".